Thanks for a fun season! The Disc Golf course is now closed for the winter. See you this summer! View or download the Course Map. Amid the mountain peaks and rolling greens, we invite you to challenge your skill set on our Double Cabin Disc Golf Course. We maintain and manage this free, par three, 18-hole course daily during the summer season, open from sunrise to sunset. The course is located across the street from Market Plaza (formerly Town Hall Plaza) and The Market at Mountain Village. From Mountain Village Center, you can hike or bike to the course from the Boulevard Trail, or take the gondola to Market Plaza. 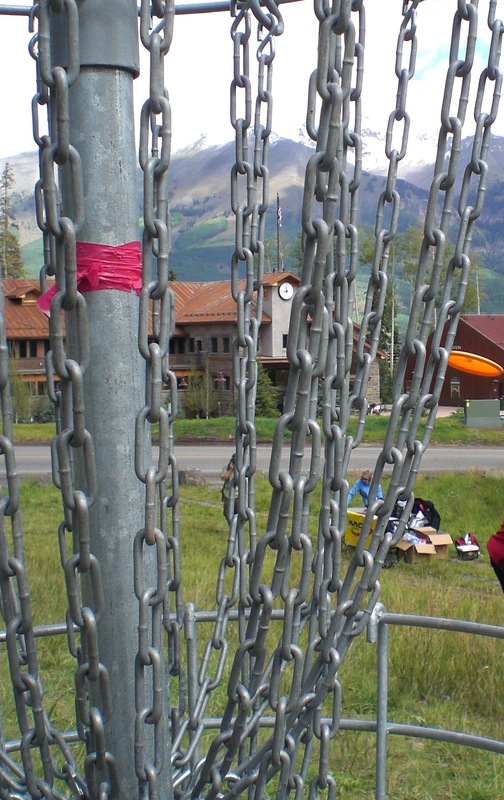 To become acquainted with the course, please review the Double Cabin Disc Golf Course Map. As for the game itself, it is played like traditional golf but with the use of a flying disc similar to a Frisbee as opposed to a ball and club. One point/stroke is counted each time the disc is thrown. The goal is to get three or less points/strokes per hole. The person with the lowest score after playing nine holes wins. To become acquainted with the course, please review the Double Cabin Disc Golf Course Map. Scorecards, picnic tables and restrooms are available at the start. For those in need of equipment to rent, visit BootDoctors in Mountain Village Center or Telluride Outfitters conveniently located next to hole one. Tee throws must be completed within or behind the designated tee area. Don’t throw if other players are in your view or in the direction you are throwing. Wait for your entire group to throw before you advance to make your next throw. Respect other players and adjacent homeowners. No loitering during or after play. Dogs are allowed on the course but make sure you pick up after your pet.